journaling Archives - Pebbles, Inc.
Hello Pebbles Friends! 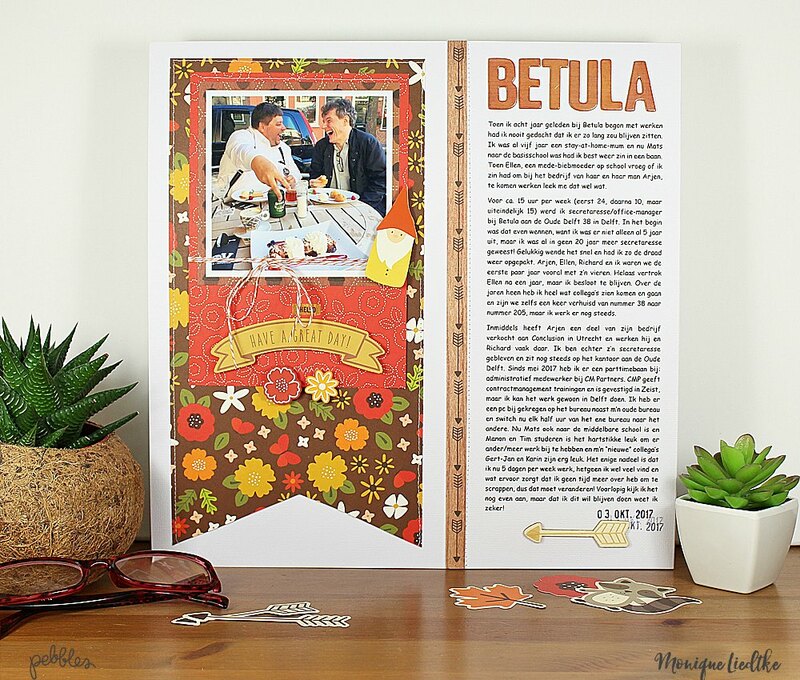 It’s Leanne here today, sharing a layout that encompasses documenting your story alongside that cute photo. I absolutely adore including journaling on my pages and I’m about to issue you all a challenge to try the same. 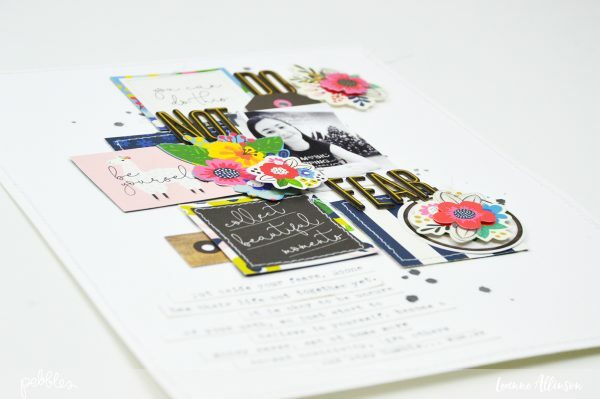 My “Do Not Fear” journaling challenge will hopefully encourage many of you to start filling in the blanks, as you scrap your pages. 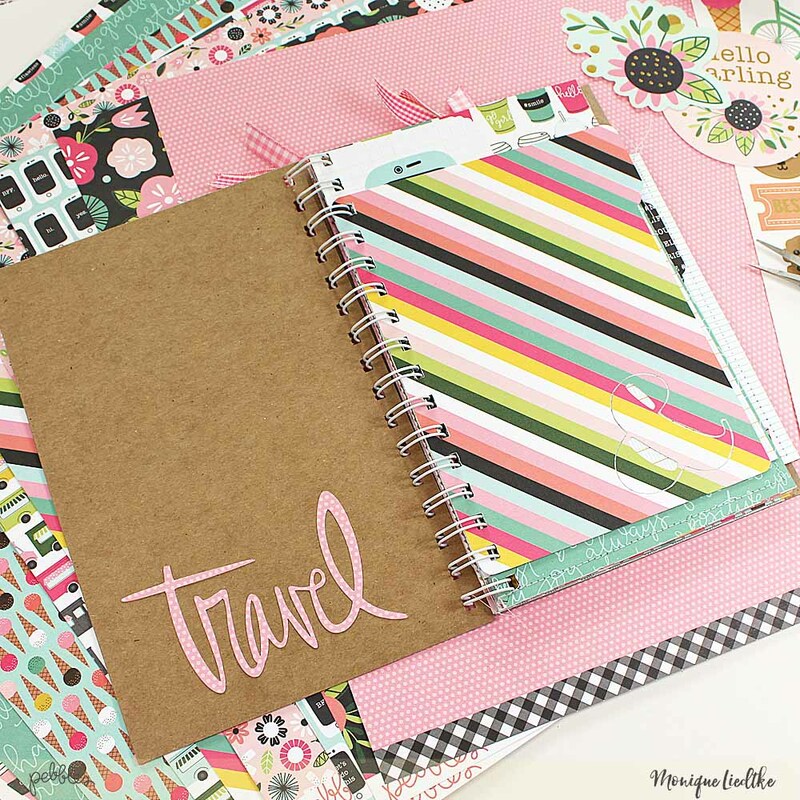 The step by step process will also share how, while in the planning stages, journaling can become a feature in its own right. It can be too easy to be distracted by all the pretty paper available. Sometimes, you just want to create and get something stuck down on a page. And both those options are perfectly fine! But I have personally found, that when I revisit my completed scrapbook layouts, the pages I value the most, are the ones that have little stories attached. Time is too short. My children, while still young, are no longer little and right now, I have a daughter on the verge of adulthood. I want to cherish as many memories as I can, especially while my kids are still living at home. Journaling the stories can be completed with simplicity. It doesn’t need to be profound or enlightening. All that is required are the basics. Document the who, what, where, why, how and when. The stories that accompany the photos, will quickly follow. However, knowing a few tricks is always a big step in the right direction. One of these is planning ahead for journaling placement. 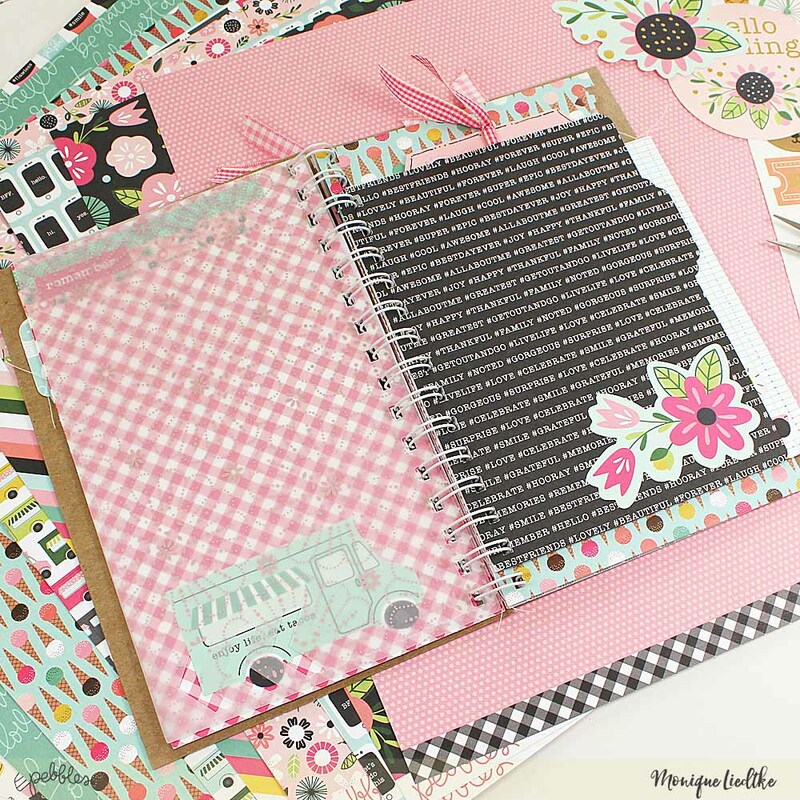 Having an area on your page, dedicated specifically for journaling, will make the process feel less last minute. As you create your page, you already start to automatically have in mind what you want to document. 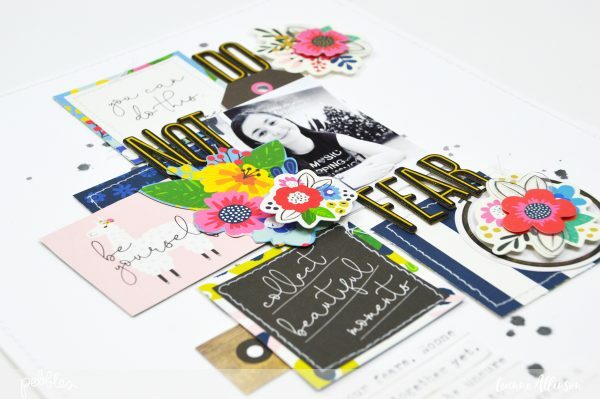 The creativity of playing with pretty papers, builds up around this concept. To recreate my layout, I have used the gorgeous My Bright Life. step 1. 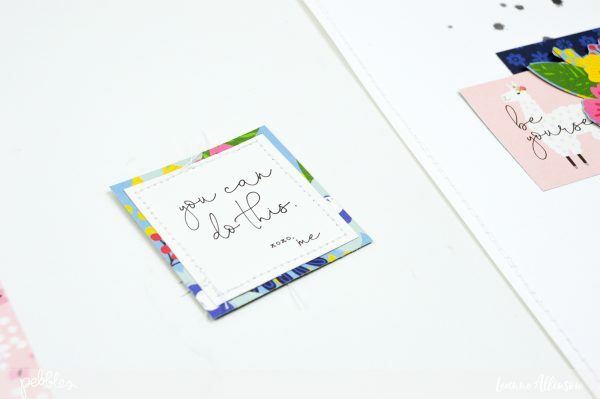 Trim the background cardstock to size. 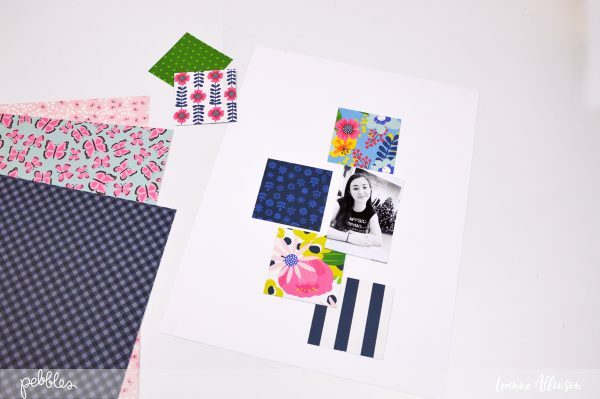 Select several pieces of patterned paper from the My Bright Life collection. 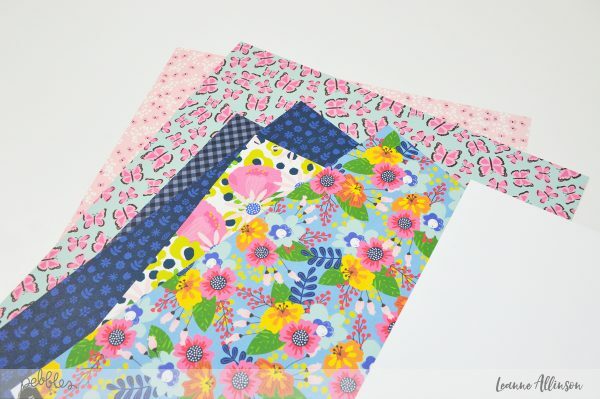 Trim the patterned paper into 2.25″ squares. 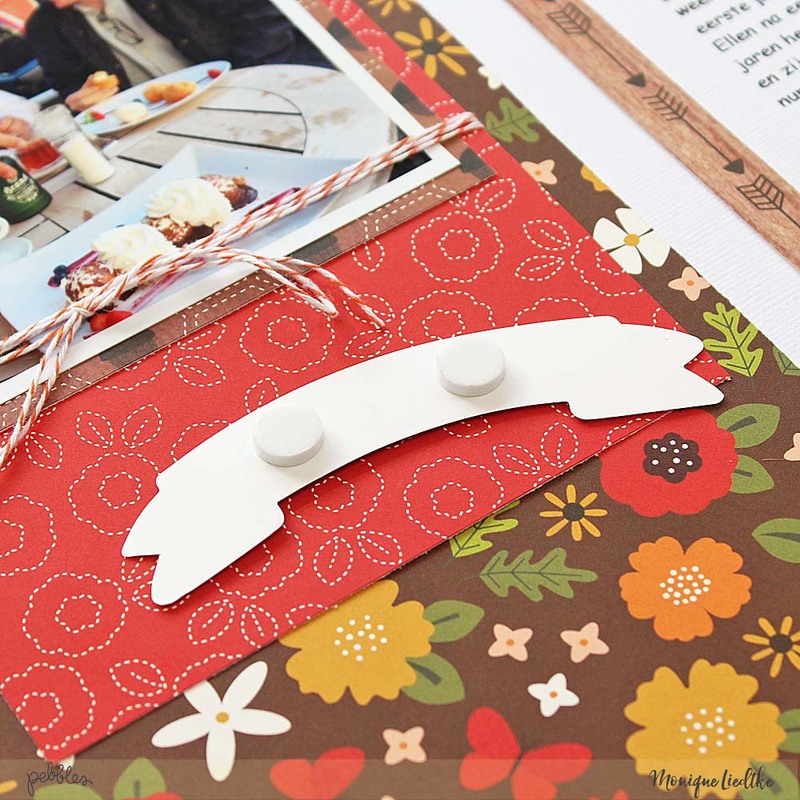 Stitch around the outside of the cardstock edge for extra dimension. step 2. 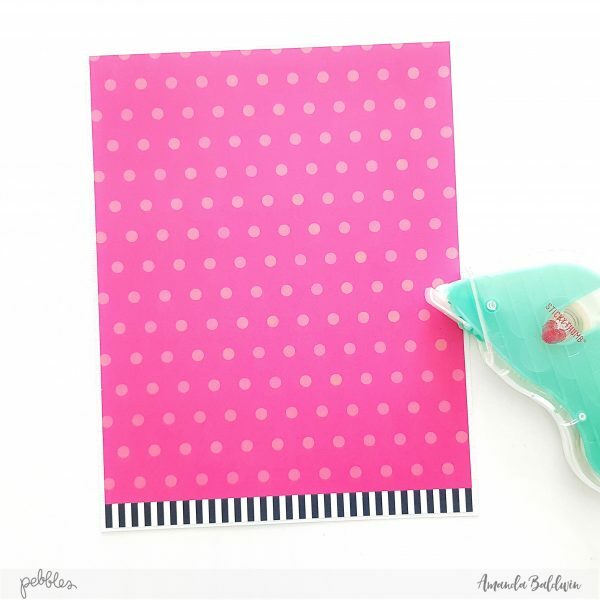 Add small flicks of black paint to the cardstock base. Allow to dry. step 3. 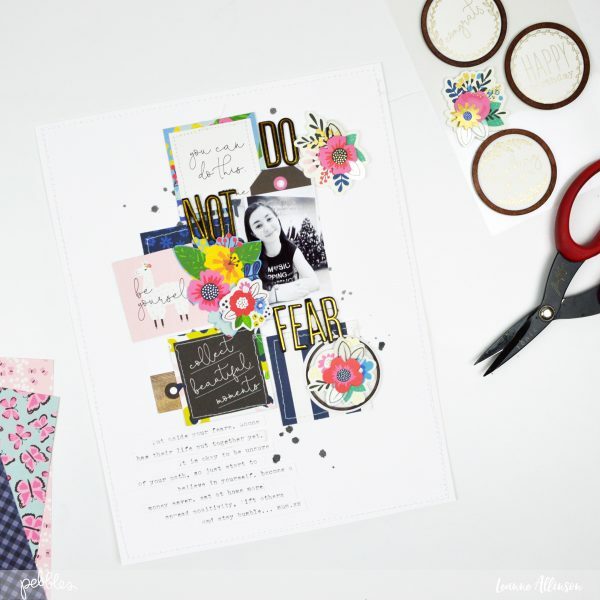 Using the My Bright Life, Little Thoughts patterned paper, trim out the sentiments which relate to your story and won’t clash with the bold patterns of the larger squares that have just been cut. Layer these smaller cut out squares onto the larger ones and add machine stitching for interest. Fussy cut flowers from My Bright Life, Fresh Picked patterned paper and position onto the layout. step 4. 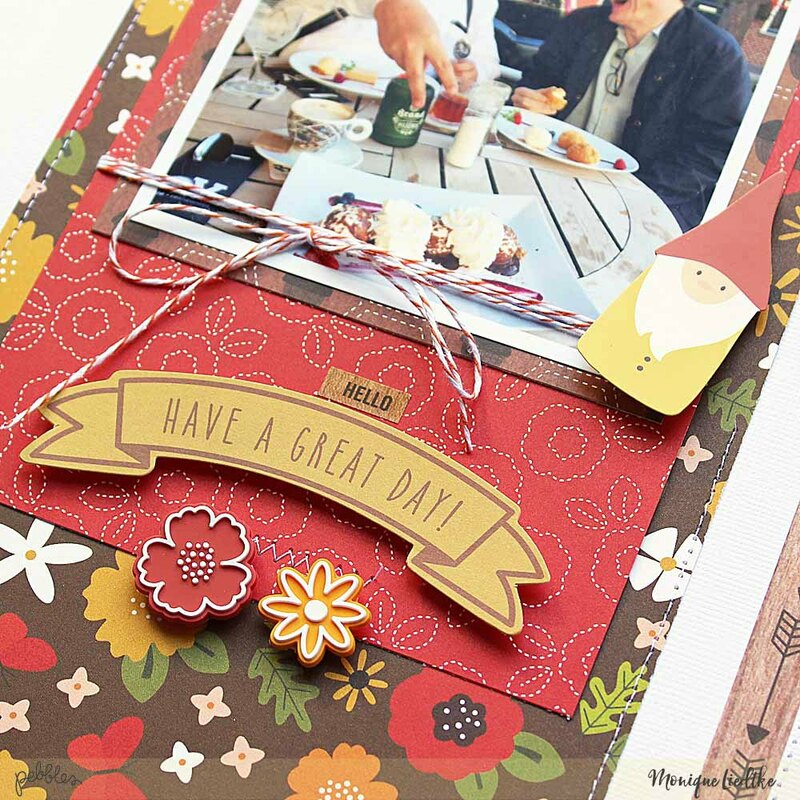 When arranging placement of embellishments and layers, position photo/s and squares closer to the top of the page. 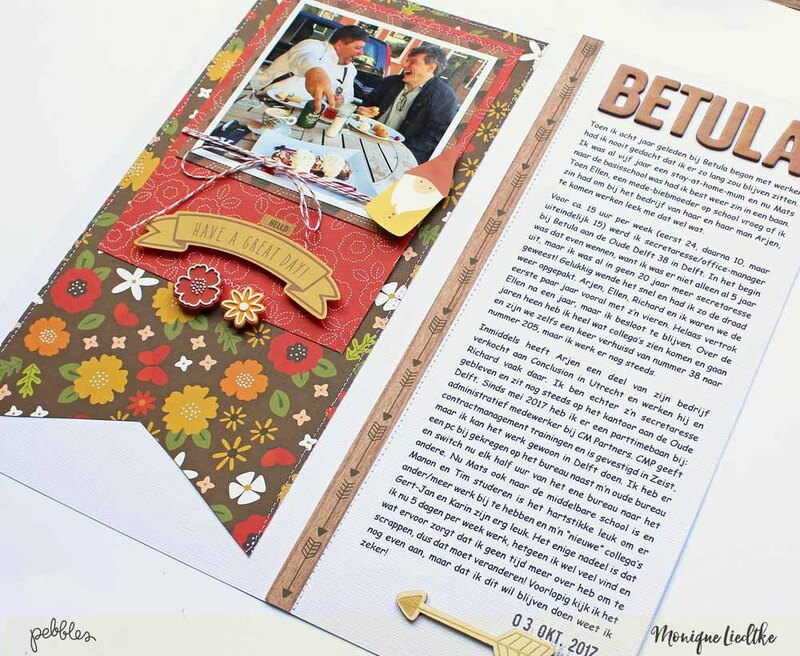 The lower third of the layout will balance the current top heavy look, with the pre-planned journaling. step 5. On this page, the title is somewhat of a parody to what I’ve been sharing today. 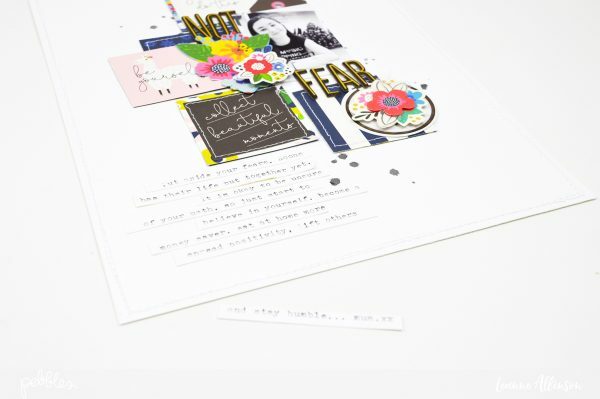 The short, sharp words, slip into place between the patterned paper and embellishment layers. It draws the eye down the page and directs the viewer to my journaling. The easiest way for me to complete this layout with my intended journaling, was to add it in the form of journaling strips. I could have hand written what I wanted to share directly onto the cardstock. However, I am not a fan of my hand writing and that might very well be a challenge for another day!! step 6. I pre-typed the story a wanted to document on the off cut from the cardstock background. Between each typed line of text, I generally hit return 3-4 times before typing again. Using my paper trimmer, I then cut between each line of text. Once all of the text has been cut out, position it in strip order before adhering it to your page. Hopefully once the idea of planning a space for your journaling at the beginning of your creative process is put into practise, more of your stories will be start to be shared. Hello lovely Pebbles fans! 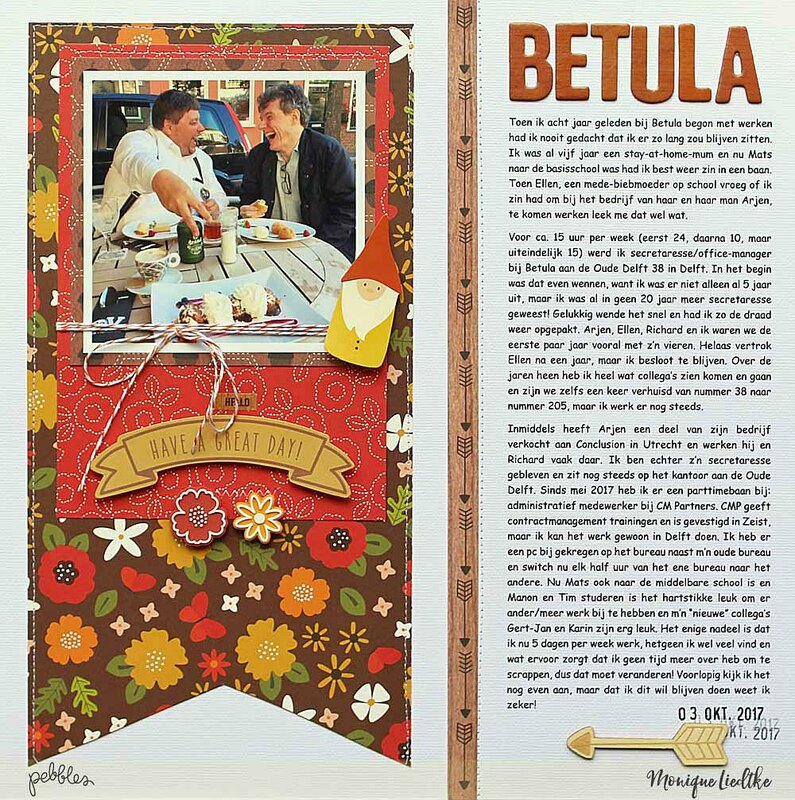 Terhi Koskinen here with a colorful scrapbook layout showing one of my favorite journaling techniques. 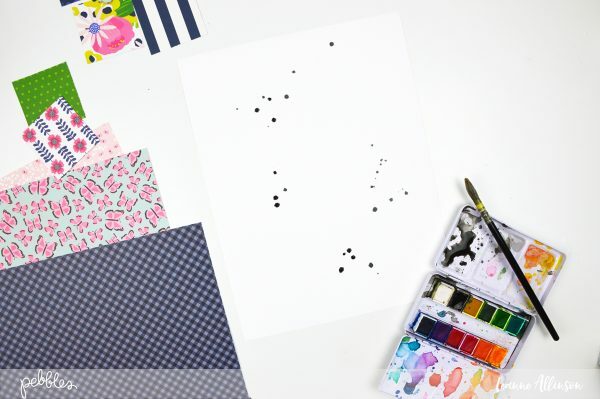 The idea behind this journaling technique is simple, I wanted the journaling to be part of the design. Not too visible, but not hidden either. Usually I write journaling to the backside of the layout for three reasons. First reason is my handwriting, I really don’t like watching it. It feels like I’m ruining a pretty layout if I write the journaling visible. Writing the journaling visible with a typewriter would be ok, but that’s still something on my Christmas wish list. The second reason is that most of my layouts are shown on social media, and as my writings are very personal, diary-like, I prefer keeping the stories for my family. Sure I always tell what’s the story behind the photograph, but the deeper thoughts are written. This goes close to reasons three, as I write long stories, it’s hard to get it fit to the page. Impossible even! 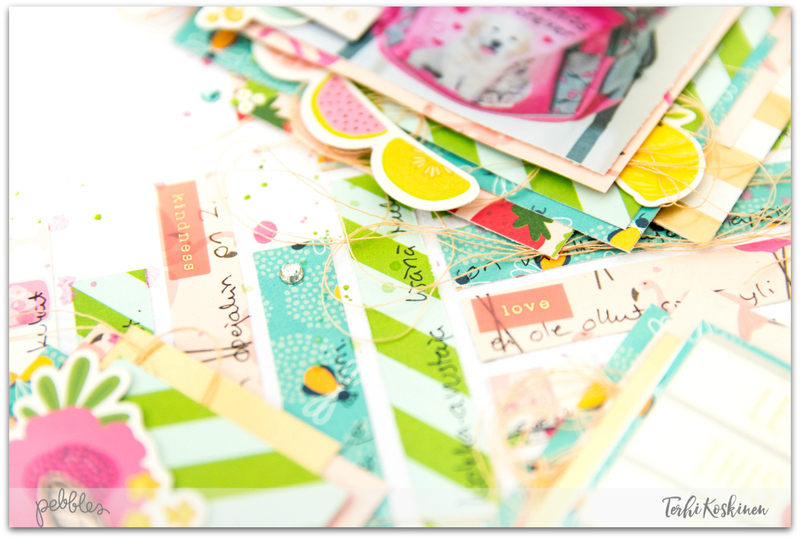 For this technique I first cut out dozens of 1/2″ stripes by using different patterned papers from Patio Party collection. The story for the layout is about my daughter’s first day at school, so I picked out the most cheerful and bright colors as possible. Then I started gluing the stripes down to the white background, randomly making a fun criss-cross pattern. Before starting to write my thoughts to the stripes I added the photograph and all the embellishments too, didn’t want to hide parts of the text. Even though I thought to keep the journaling all visible, it is tricky to read because of the criss-cross pattern, but I’m sure I’ll have the viewers attention with this technique! Also, it is so much fun to see them reading, turning both head and the albums from side to side! And I’m totally satisfied to have handwritten journaling visible, without highlighting my penmanship. 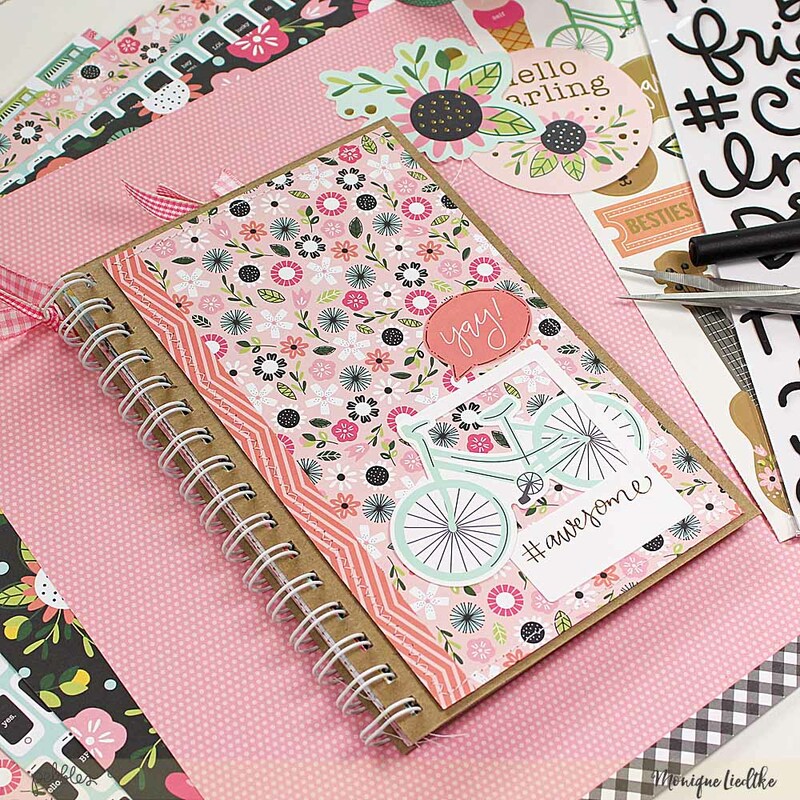 What kind of journaling you prefer? What’s your secret, do you practice your handwriting or even write in beautiful calligraphy style? Or do you write down the memories at all? Please share all the ideas here in the comments! Thank you for coming here today, have a wonderful Wednesday! Big Photo Fun with Patio Party! Welcome back for more beautiful and inspiring ideas with our gorgeous Patio Party collection! 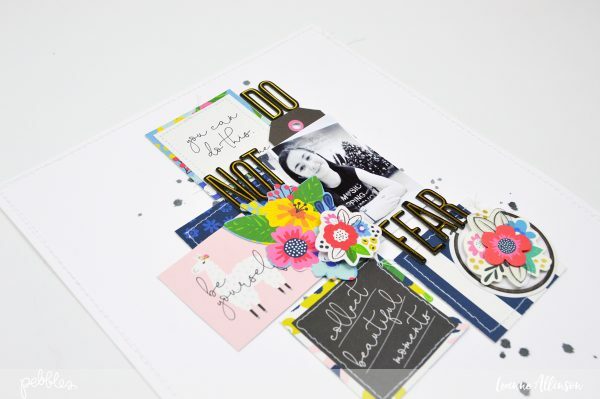 Amanda here, and I am just a bit excited to share my latest creation with this pretty line! This week’s Design Team assignment is all about journaling; but what do you do if you’re not a fan of your own handwriting??! Never fear, I have a terrific alternative for you! Adding text to your photos BEFORE printing them! I know, it sounds fancy but I promise you, it’s anything but! Before I show how simple this technique is, let’s take a look at how effective it looks! Oh isn’t this the sweetest?! And such a fitting title! Smile indeed! 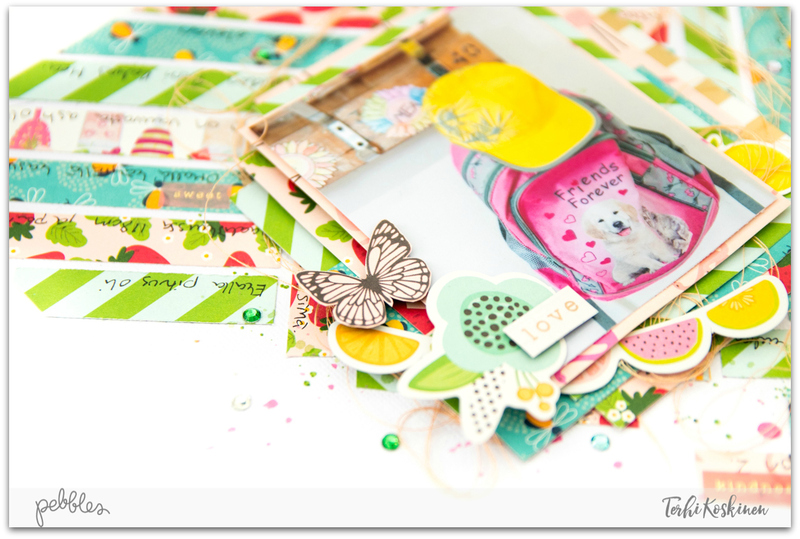 The Patio Party collection is so bright and playful and has a darling array of embellishments and Thickers to adorn your pages with! 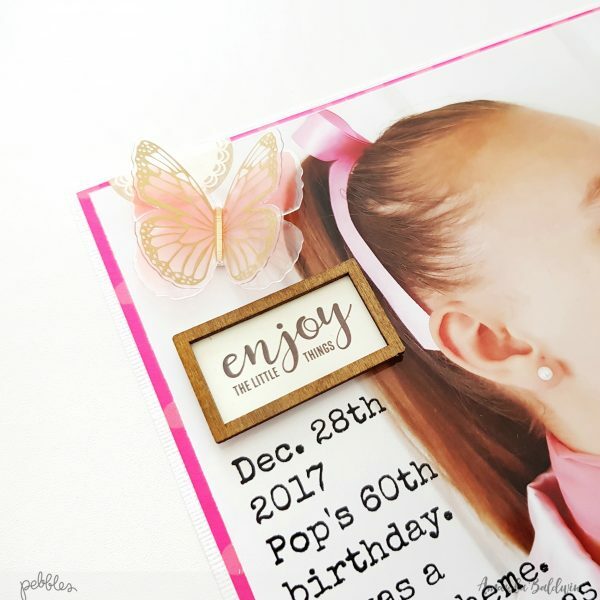 I love a big photo layout, and this one really highlights the importance of a few well chosen scrapbook papers and embellishments. Gorgeous! Here’s how to recreate this look…. You’ll need to start by selecting a photo that offers some white or very light space. This is important as you need to be able to read the text easily. Also, make sure that you’re editing a COPY of your original image. Once your photo is selected, start by opening up your photo editing software or photo editing app. Select to edit your photo, and then select the ‘add text’ option. Position & size your text box, and enter the story you wish to tell. This part requires a little bit of experimenting! While you’re there, have a play with fonts and text size too. Once you’re happy with the text, flatten your image and export it, or if you’re using an app, save all changes. Send the image to your printer and voila! For this specific layout I printed my photo 8′ x 10″, & I opted for a typewriter style font that was larger and easier to read. Even on it’s own it looks so effective! Similar to a digital stamp, but with your choice of words! Next I take out my paper trimmer & cut a 12″ x 12″ sheet of white cardstock to 8.5″ x 11″, as well as trimming reverse side of pattern paper TULIPS to 8 1/4″ x 10 3/4″. You’ll notice that I leave the patterned barcode strip attached to the TULIPS paper and include it in my cut. This is simply because I LOVE the contrast and interest it creates at the base of my page! It also helps to draw your eye into my title too! Adhere the pattern paper to the cardstock, as shown. And then add your ‘journaled’ photograph! Big photos are FUN!!! Doesn’t this grab your attention immediately?! Love it! 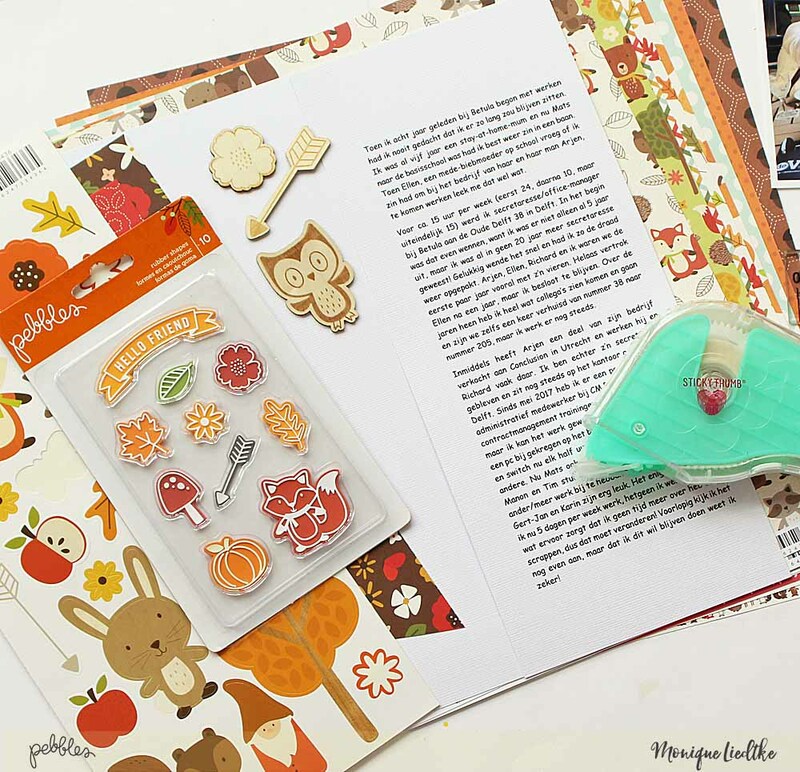 Next, I embellish my layout with a few carefully selected items…. 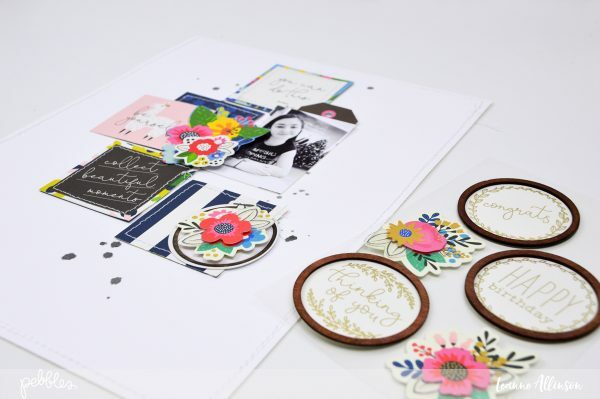 I add a circle sticker from the Jen Hadfield #StickerBook (which I cut into a semi circle) before adding to the top of my page, a sweet BUTTERFLY STICKER, and lastly that incredible WOOD VENEER LAYERED STICKER. Small details, big impact! 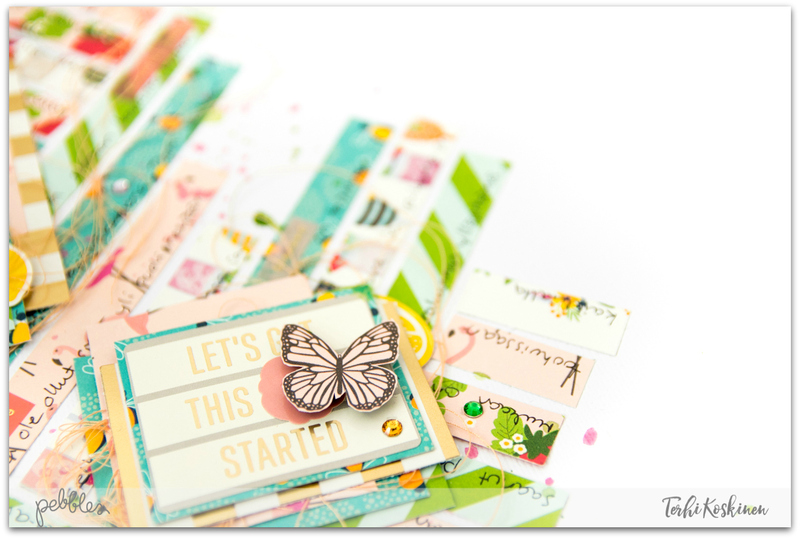 For the base of my page, I add a floral sticker from the Jen Hadfield #Sticker Book, another BUTTERFLY STICKER, as well as that title from the PATIO PARTY PHRASE THICKERS! For finishing touches, I sprinkle a few sequins onto my photograph. And there you have it! A beautiful memory documented; with minimal fuss but maximum impact! Simply gorgeous! Patio Party is perfect for documenting those beautiful life moments! 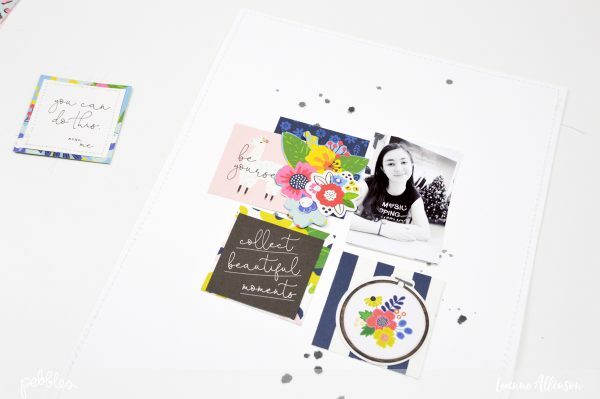 I can’t wait to see what you’ll create with this collection, & I hope you’ll give journaling ON your photographs a try too! Hi everyone! 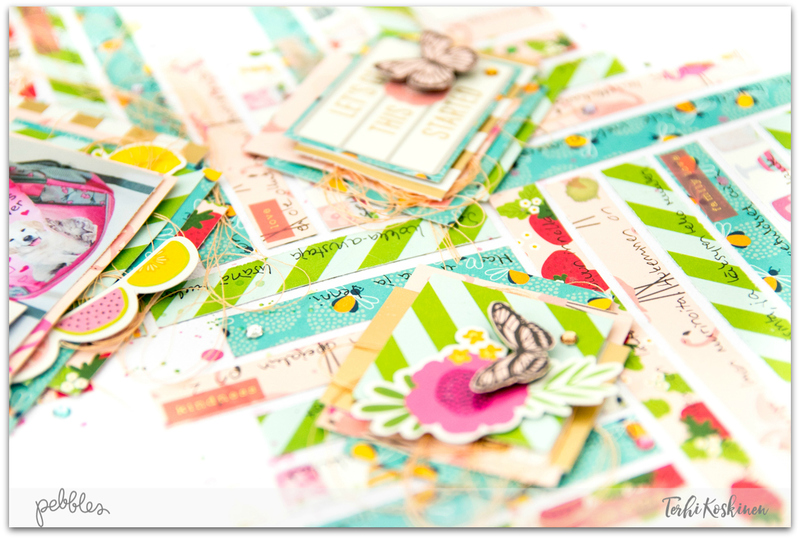 Monique here today, sharing a fun layout about my work using the Woodland Forest collection. Did you know it’s “Bosses Day” today? I didn’t, so I had to learn more about it! When I looked it up, I found out that it’s a day “to thank our bosses for being kind and fair throughout the year”. When I read this, I decided it was high time I created a page about my boss and my work. I’ve been working for him & the company with great pleasure for eight years already! As this week we (at Pebbles) are also focusing on journaling, this really was the most perfect opportunity to write about my work and add it to my page. 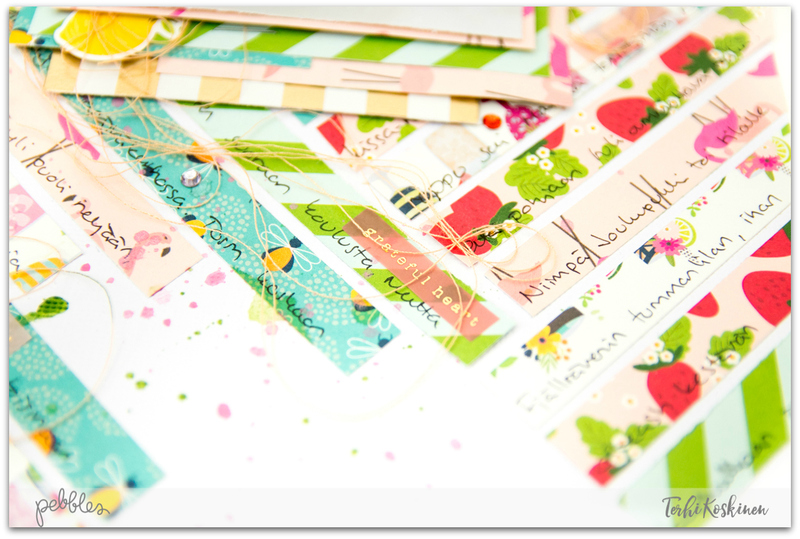 The cardstock with the journaling was adhered on the right side of my layout. To hide the “seam,” I glued a strip of paper over it. Next, I matted the photo and placed it on two pieces of patterned paper. Before adhering everything together, I wound a piece of twine around the photo for added texture. To add more depth to my page, I adhered the sticker of the gnome and the banner die-cut to the page—both with some AC Sticky Thumb foam adhesive. Except for the gnome sticker and the banner die-cut, I also added these two rubber shapes. Aren’t they just perfect?! Even though this layout doesn’t conform to my usual style, which uses many more embellishments, I really like the result. Hope you do too! Have any projects to help with your summer holidays? With our next one in mind, I decided to create a travel journal—one that I could easily bring with me and that needed only a couple of pictures and handwritten stories to complete.Hello Pebbles fans! 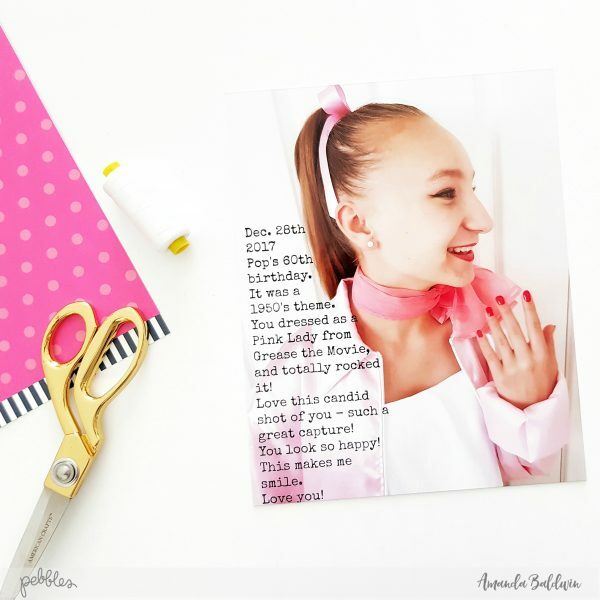 It’s Monique with you today, sharing a Fun and Funky Girl Squad Journal! When brainstorming how I wanted to put things together, I needed the embellishing mostly done so that a few stickers and washi tapes would be enough to bring along with me. What I find so fabulous about the Girl Squad collection is that it can be used for almost every occasion. When you look at my album, you see that it’s not a travel album just yet—my photos and texts will make it that—but I could also easily turn the album into a family or girls-weekend-out album… the possibilities are endless! 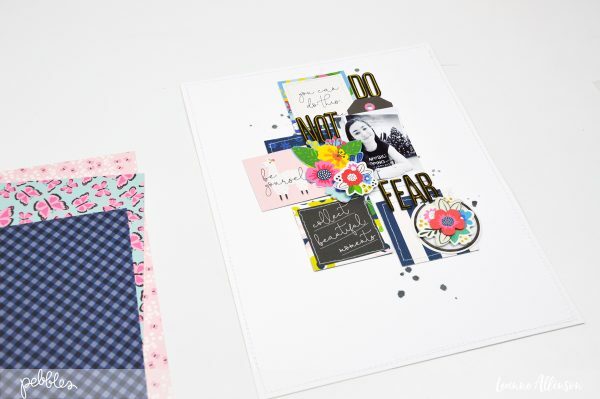 The journal includes 20 different pages & 2 tags; it measures 5.5″ x 8″. 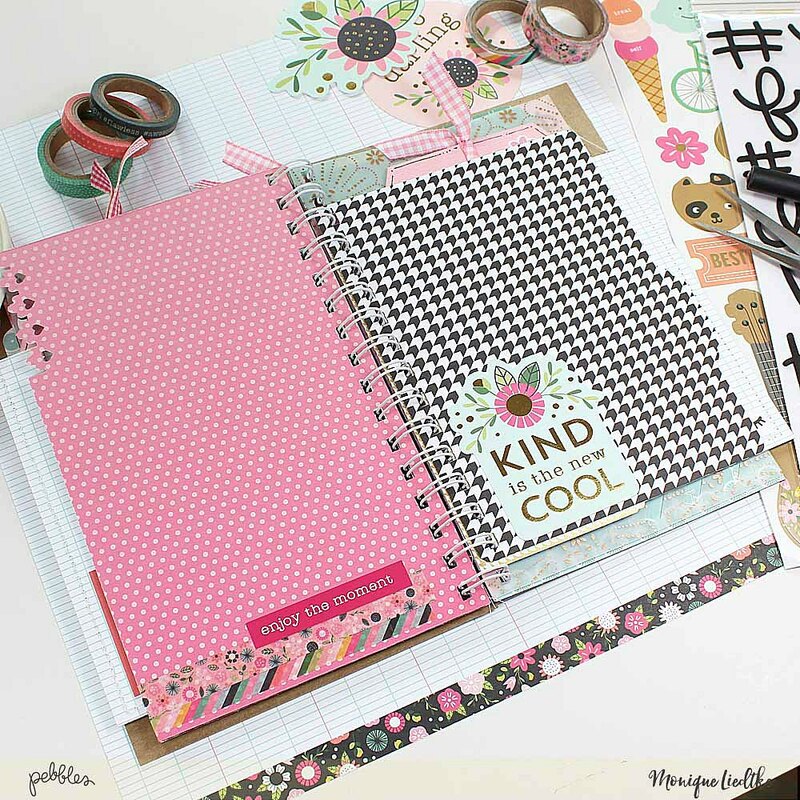 Here’s a photo of the cover of my “Fun and Funky Girl Squad Journal”. 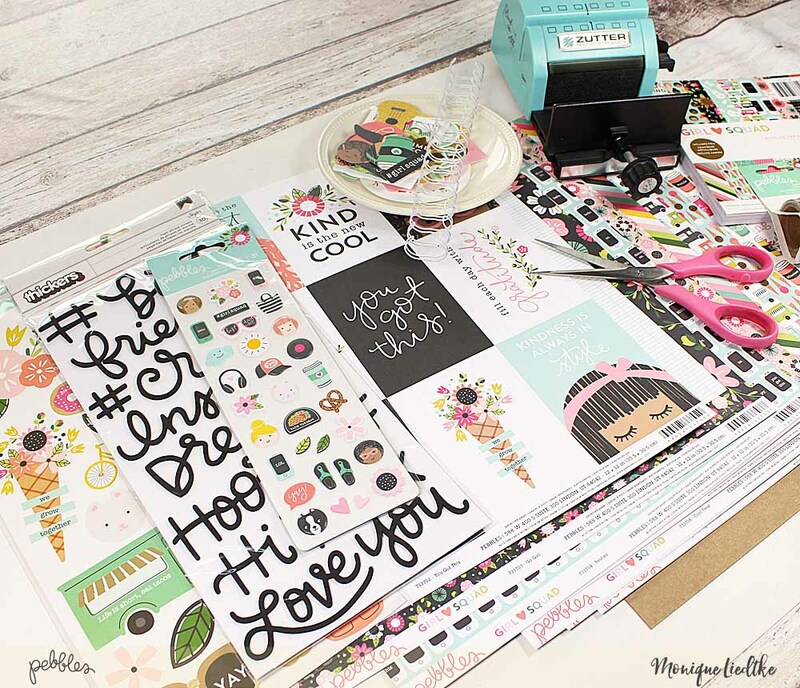 I just love all the papers, die-cuts, stickers and washi tape in this collection! Before I got started on my project, I gathered everything I thought I would need, including a piece of heavy cardboard for the front and back of my journal and my Zutter to punch the holes. 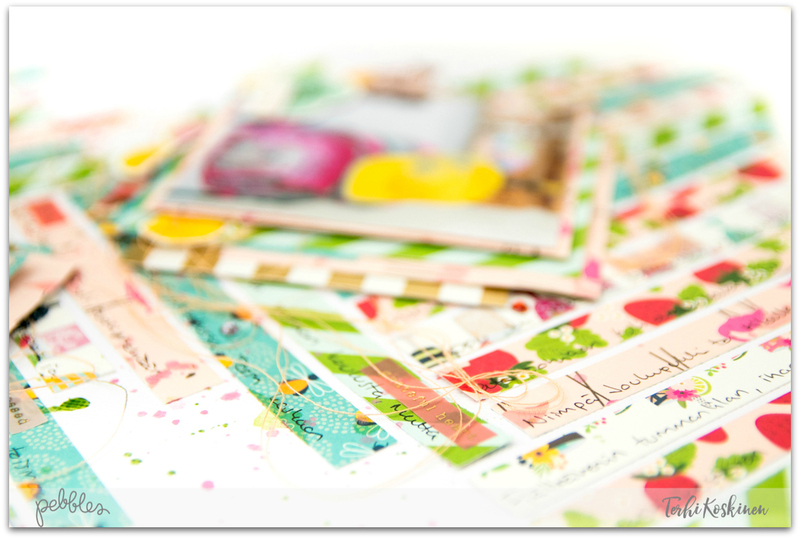 I’ve used almost every patterned paper from the Girl Squad collection for my album, as they are all equally fabulous! Let me show you a couple of pages from my journal. Here’s the first page. I left most of the left side blank as I want to adhere a large photo there. From the right page (the first of four tab pages), I cut out a large ampersand and adhered it in the same spot on one of the next pages. 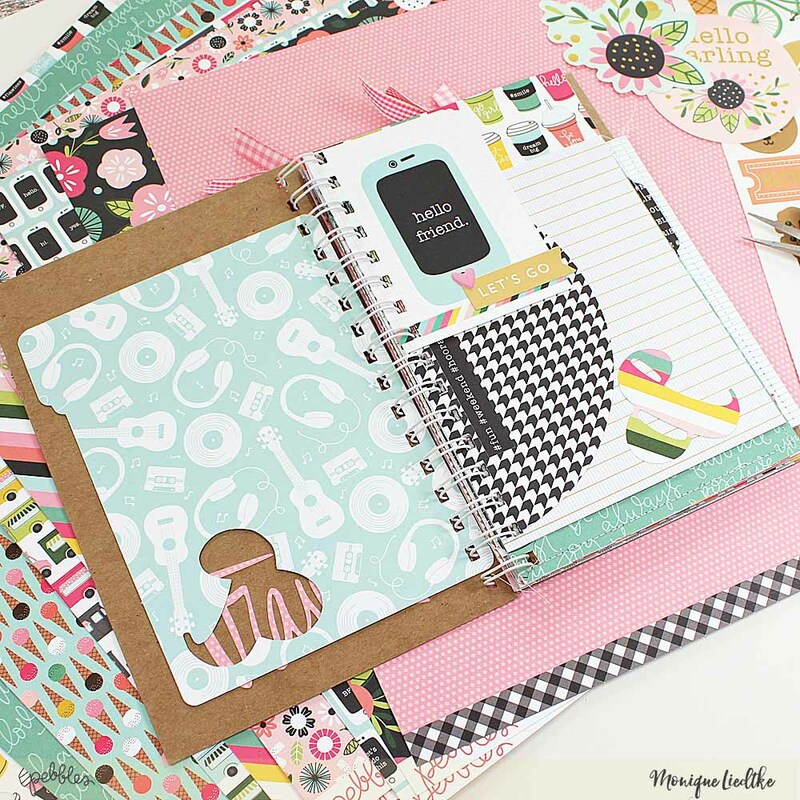 Every page in this Funky Girl Squad Journal is different. The sizes, patterns, forms… everything is different. In the photo below, you can see I stitched a triangle in one corner to create a space for all the bits and pieces I tend to collect during my vacations. Have you seen that coffee cup paper? Isn’t it awesome?! From the “You Got This” paper, I created a bag with a tag inside by folding the paper in two and stitching the sides closed. The outside of the bag is perfect for journaling. 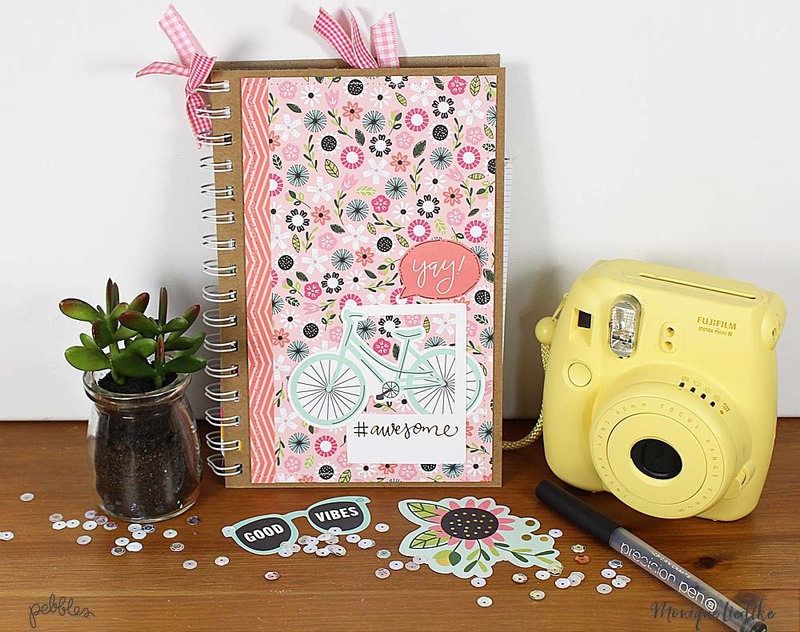 How I love that bicycle paper!! When my album was finished, I realized that I had been inspired by the mini albums by Amy Tangerine. If you look them up, you’ll see just what I mean. This is it! My Funky Girl Squad Journal. I’m going to use it for a travel journal in the south of France. Together with my Instax camera and some stickers and washi tape, I’ll journal all the fun memories we make. I’ll make sure to show you the result as soon as it’s finished.